Parc Mosaic is slated to become the premier rental destination in Boulder, Colorado for a wide demographic – from empty nesters to young professionals moving from out-of-state. Parc Mosaic is on track to be certified LEED Gold and has a wide array of one-of-a-kind amenities to complement Boulder's unique blend of outdoor and luxury living. 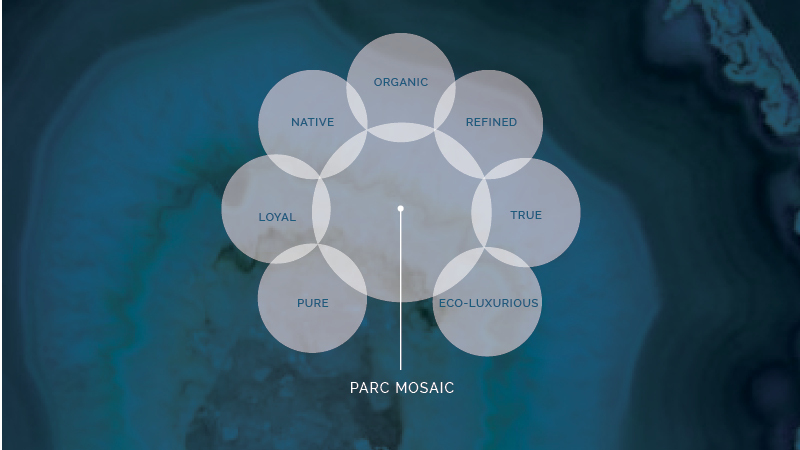 Parc Mosaic was chosen as the name to reflect the thoughtfully planned green spaces throughout the community as well as the diversity of residential living choices that assemble into one modern and luxurious living experience. Après Creative Group was delighted to partner with the architects and developer for Parc Mosaic. Our early involvement allowed us to synchronize the brand with the physical structure and smartly position it within the City of Boulder. Given the green aspects of the property, Après leaned heavily on the original designer, Mother Nature, to inspire the refined and modern mosaic pattern. The classic yet current font communicates the upscale/refined tone of the community.